Police were called to reports that a woman in her 30s had been sexually assaulted at a music venue in Manchester on 1 October. Mr Langley, 34, of Altrincham, who played Todd Grimshaw, is due to appear at Manchester Magistrates’ Court on 28 November. The actor left the soap following an internal inquiry, ITV said. A Greater Manchester Police spokesperson said the force “received a report that a woman in her 30s had been sexually assaulted at a music venue on Swan Street in the Northern Quarter”. In a statement on Sunday, Mr Langley confirmed he had left Coronation Street but denied any claims of wrongdoing. He said: “Sadly, I will no longer be working on Coronation Street. Acting on the show has been the fulfilment of a personal dream. 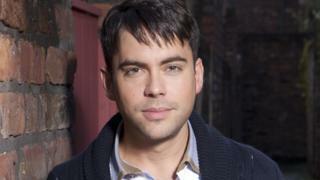 The actor played Todd Grimshaw, the first openly gay character in the soap’s 57-year history, after first joining the programme in 2001. He also appeared on two episodes of Doctor Who in 2005. It is understood that Mr Langley’s contract with the show ended on 26 October following an inquiry.